I'd like to work as effectively as possible for 8-9 hours a day, whether at work or studying. At some point in completing my major in psych I remember hearing about the importance of taking breaks while doing work (e.g., Trougakos and Hideg, 2009 on momentary work recovery). 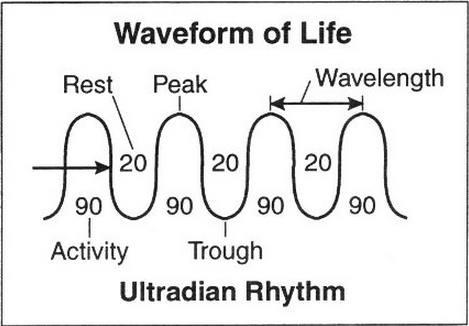 Gopher et al (1995) discuss ultradian rhythms and working for 90 minutes for every 15 minutes of break. Some methods like the pomodoro technique suggest 25 minutes of work for every 5 minutes of break, with a 15 minute break every 4 cycles. How does the optimal work-break rhythm vary by task, context, or other moderating factors? Trougakos, J. P., & Hideg, I. (2009). Momentary work recovery: The role of within-day work breaks. Research in occupational stress and well-being, 7, 37-84. It appears extended working days, such as, 16 hours are counterproductive. (1) Safe working hours - doctors in training a best practice issue examines the effects of extended working hours on performance for doctors. It is recommended that a 7-8 hour working day is more productive than extended days. One issue being the sleep deprivation that accompanies extended working days. There is research on optimal work-break rhythms. It has been found that work performance is optimized in 90 minute time slots. This is improved by dividing this into 25 minute time slots, with short breaks. With relation to the type of work, it is suggested that breaks be taken away from the working environment, optimally, within an altogether different environment. (2) Best Rest Practices for Optimal Productivity and Creativity. This addresses your questions comprehensively and also confirms that an extended working day is counter productive. Rossi champions the 20-Minute Break in his book of the same name for peak performance. And Anders et al studied in 1993 a group of violinists and discovered that the best performers practiced in 90-minute intervals and learned not to over-practice. We can break down that 90-minute rhythm even further into 25-minute spurts. Most people can pay attention to a talk for 25 minutes (hence, the brilliance of TED Talks’ 17-minute limit). I recommend to clients they remove themselves from the work environment if possible. For a corporate client, I recommended he schedule a walk to another part of his vast office quarters, glance out a floor-to-ceiling window, and then return to his office room, sit in a comfortable sofa normally reserved for clients, and remember the last time he was outdoors working on his ranch—one of his favorite activities. Step outdoors if you can. I suggested that one client who gets overwhelmed with multiple tasks in the afternoon to step outdoors and sit in her garden for fifteen minutes and simply observes the colors, textures, sounds, and smells. Ideally, she would weed for fifteen minutes as the physical activity more likely will let her processor mind incubate some of her creative problems. Or step away from your work space, and read four pages from a book that brings you delight. If you can jog or bicycle for 20 minutes, even better—as you’re also increasing the chances of your hippocampus forging new neurons in your middle-aged gray matter, according to Fred Gage of the Salk Institute and other researchers who’ve examined the benefits of intentional, enjoyable cardiovascular exercise. DISTRACTION CAN RE-BOOT LONG-TERM FOCUS. () Here’s a mind-twister: Atsunori Ariga and Alejandro Lleras of University of Illinois at Urbana-Champaign, United States questioned the assumption that loss of focus came from, say, fatigue or lack of attention. In 2010, their study published in Cognition concluded that a deliberate distraction or introduction of a second task actually can increase vigilant attention on the first task. Utilising multi tasking to break mental fatigue. Pay attention to when you need to introduce a quick second task. Maybe sending off an email or text message will free up mental bandwidth and get you re-committed to the high-thinking task. Do this in tandem with the “Break with Rhythm” suggestions above. Some students took no naps. Some students took catnaps. And some students took full-fledged 90-minute naps complete with REM dreams...//... students who took the full REM-level naps showed boosts in creative problem-solving performance. Schedule non-digital time in the evenings, especially 45 minutes before sleep. Set up a bi-weekly schedule of evening rhythms: One Monday as “reading night,” One Tuesday as “date night,” et cetera. If you must work some evenings, schedule work evenings. Make them the exception instead of the rule. Not the answer you're looking for? Browse other questions tagged neuroscience motivation performance io-psychology well-being or ask your own question. How do I make myself think before I act?